DMR (Short-Run effect) - adding more inputs(labor) to a fixed factor of production(factory) will lead to increasing output but eventually as more inputs are added output will decrease and eventually become negative. We understand this as we have graphed it quite a bit. As we add our initial amounts of labor the marginal product (the output attributed to the next worker hired) increases as workers are more efficient (able to specialize) at their work. Adding more and more workers will increase the the TP (total product) output but at a decreasing rate. If we are foolish and keep adding workers the amount of output will eventually start to decrease and eventually become negative. 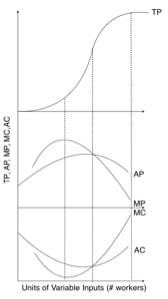 Understand that the MC curve is the cost of Labor and the MC curve above the AVC curve is the firms supply curve. If MR = MC then we are at profit max,, optimal quantity of workers. 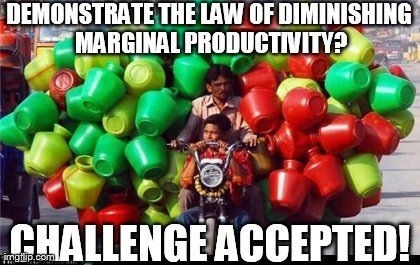 In the Short-Run the firm can only adjust its amount of labor (output). We adjust our amount of output (quantity) to maximise profit (MR=MC). This of course changes as the price of the good increases or decreases. As the (price of the good) increases we can make more profit and therefore hire more labor. Understand that the Max profit point is where MR=MC and where MRP=MRC,,,, if there was a quantity of labor that would create more profit then we wouldn't be at profit max. So if we are at MR =MC, then we must be where MRP=MRC. If MRP = MRC then we are at profit max,, optimal quantity of workers. EOS - (Long-Run Effect) - Competitive advantages gained by a firm that expands its size. These include efficiencies such as buying in bulk and therefore reducing unit costs or having one human resource department shared between factories. In essence, EOS depends on the size of firms that can fit into an industry. If demand for the good increases and as firms rush into the industry and our firm grows larger and resource costs still fall then we say the firm has economies of scale (EOS). The industry can handle more firms and existing firms should increase their size. The firms LRATC's are falling as they produce more output(quantity). If the firm becomes to large and loses efficiency due to being to large, then diseconomies of scale will occur. If the industry has the right amount of efficiency and size then we will say that the industry is a constant cost industry and resource prices are not affected by firms entering or exiting the industry. Check out the LRS/LRATC curve cheat Sheet here. If a firm is of an efficient size (in a constant cost industry) the they are at productively and allocatively efficient. 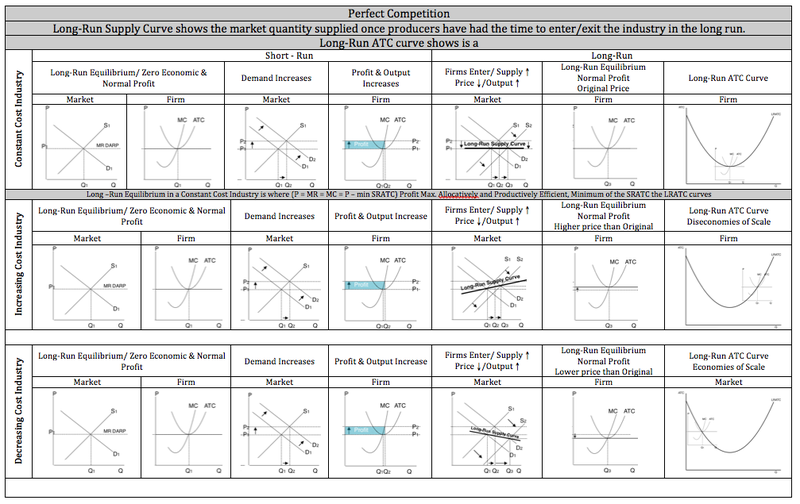 The firm is producing at the minimum of the SRATC and the LRATC curve.